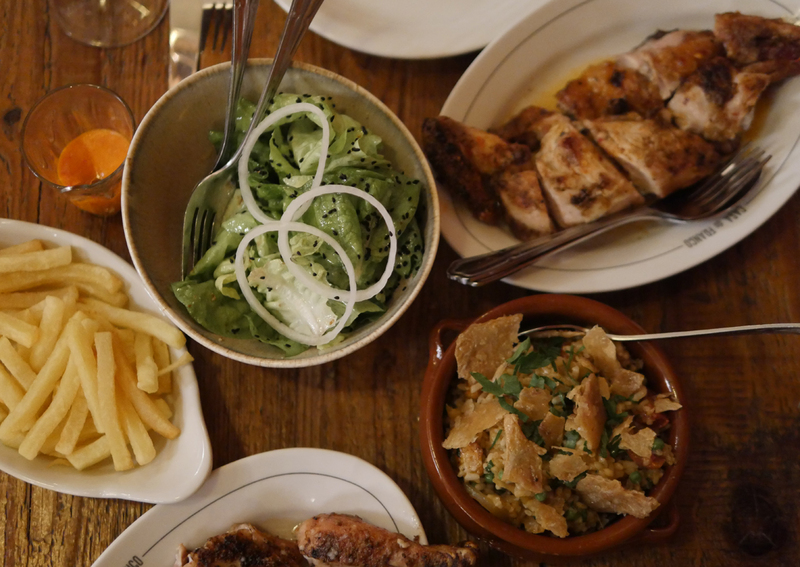 Round the corner from Borough Market, you do need to look quite hard to find the entrance to Casa do Frango. Upstairs in the same building that houses ‘Native’ (somewhere I really DO need to try soon), it’s a large, warehouse-style affair that somehow manages to combine a vast space, distressed walls and bench seating with a cosy feel. 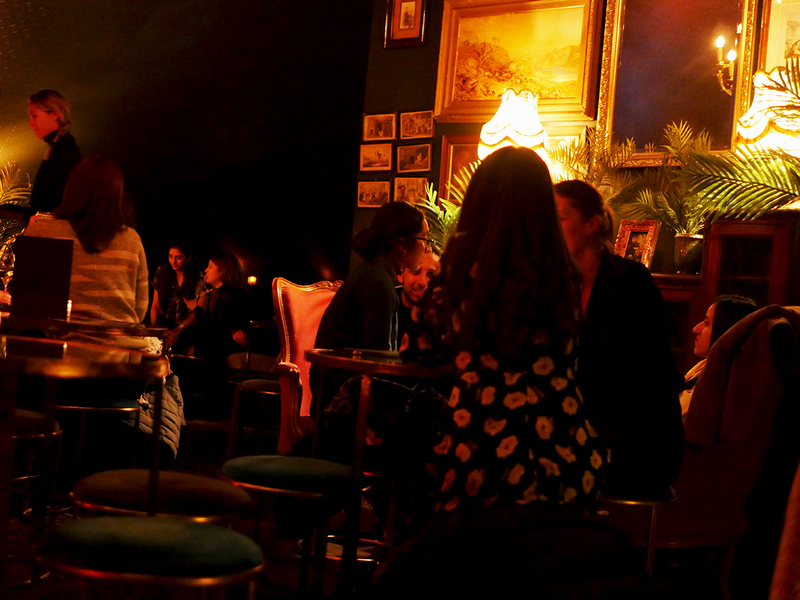 Diagonally opposite the entrance is the space you should head for if you’ve arrived early and want a drink. 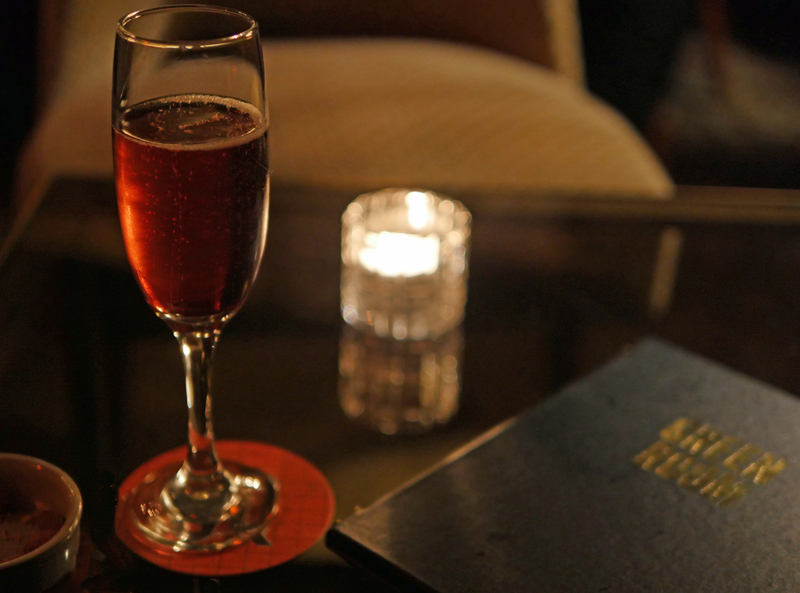 Enter the Green Room and cosy up on the shabby chic velvet chairs for a quick cocktail before you go to eat. 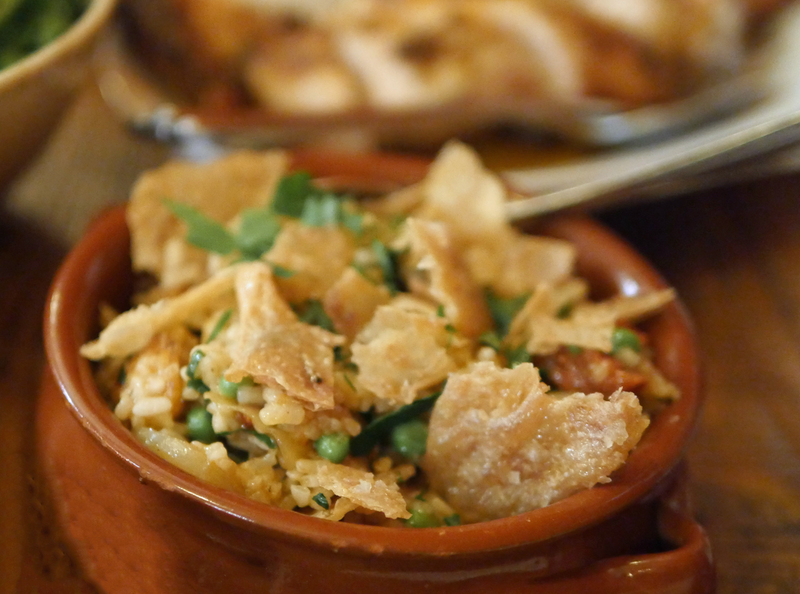 Food is the main event though, with a selection of Southern Portuguese origin dishes. 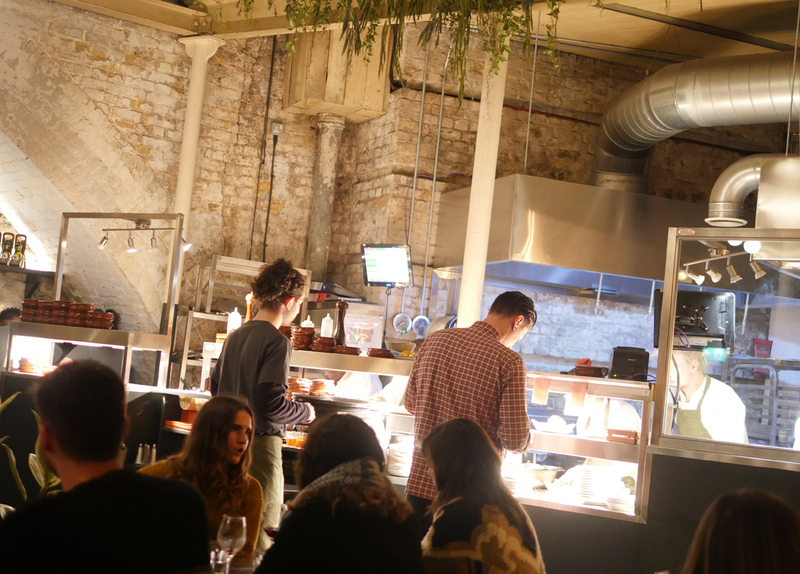 The menu is concise with an open kitchen in one corner of the restaurant. For starters (or perhaps to eat throughout the evening) there is a choice of sharing plates. We ordered a bottle of rosé wine, Camila, Quinta do Espinho, from the wine list. The choices are all Portuguese and this particular pink wine is from a historic wine region laid out in 1757, the Douro. Rather charmingly named after Camila, one of the workers at Quinta do Espinho who passed away in 2014 at the age of 92, like a lot of Portuguese rosé wines, it was aromatic, well balanced, fresh and quite intense. Something that would work across the meal even with the heat of the Piri Piri. 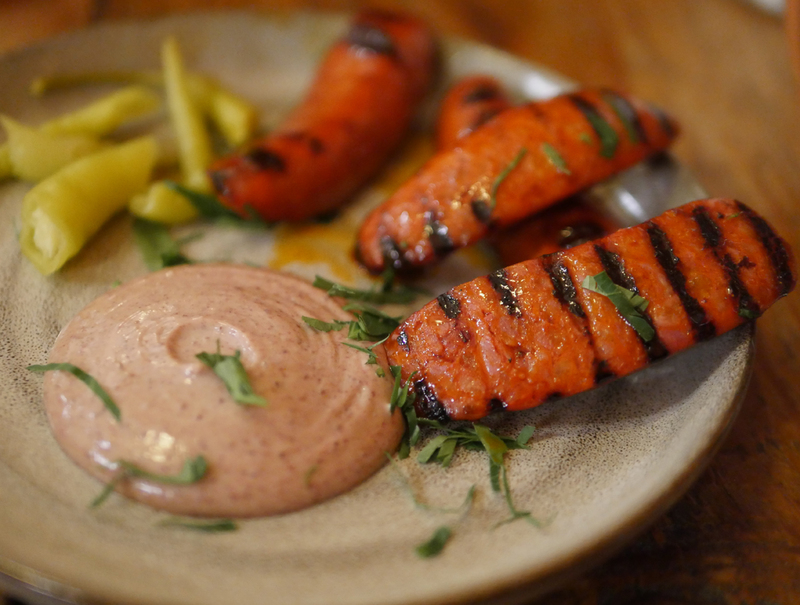 Grilled Chorizo with black olive mayo and guindilla peppers (that’s pickled chillis to you or me) was suitably spicy with a nice char on the skin of the sausage. 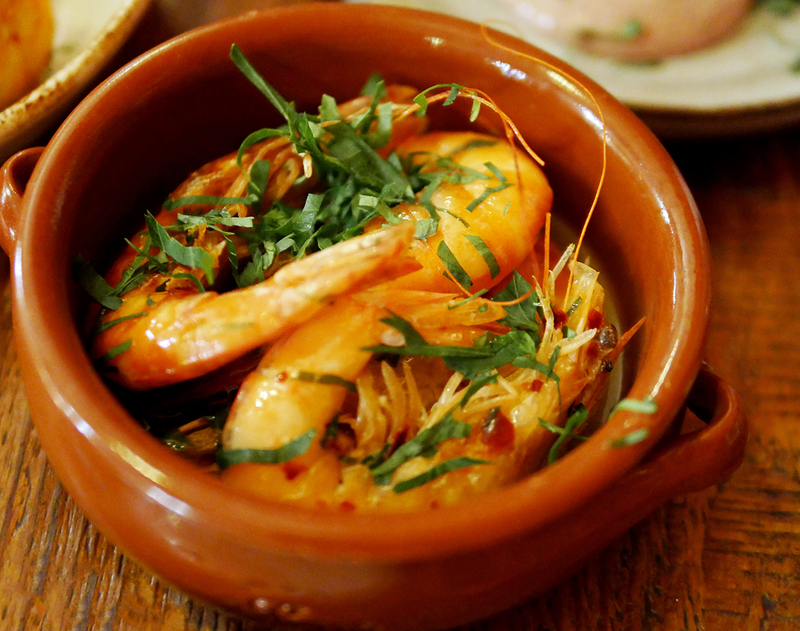 Piri Piri Garlic Prawns with white wine and parsley came with lovely plump prawns in shells. A finger bowl might have been useful – but as it was a packed Friday night service, we simply enjoyed sucking the juice from our fingers! 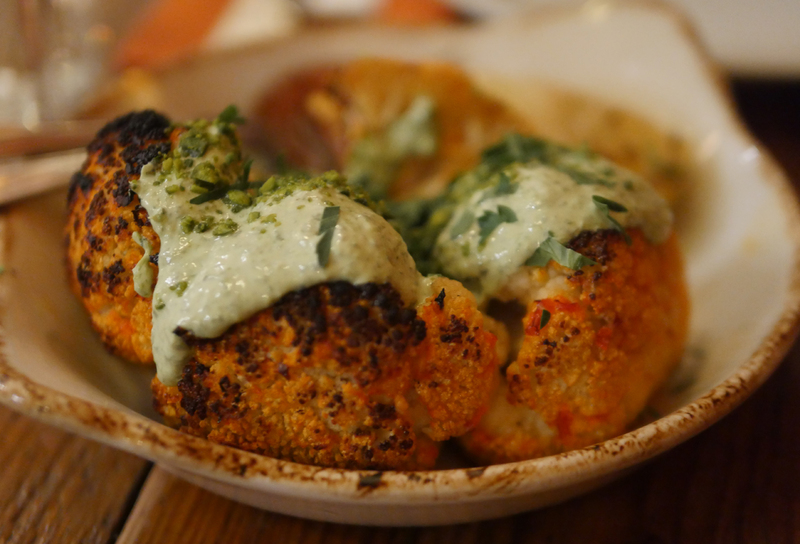 Chargrilled Cauliflower with Piri Piri, coriander yoghurt and pistachio was a surprise hit with both of us – we’d ordered what we thought might be a healthy option but while this might well have been just that, it was also deliciously nutty, full of flavour and really moreish. 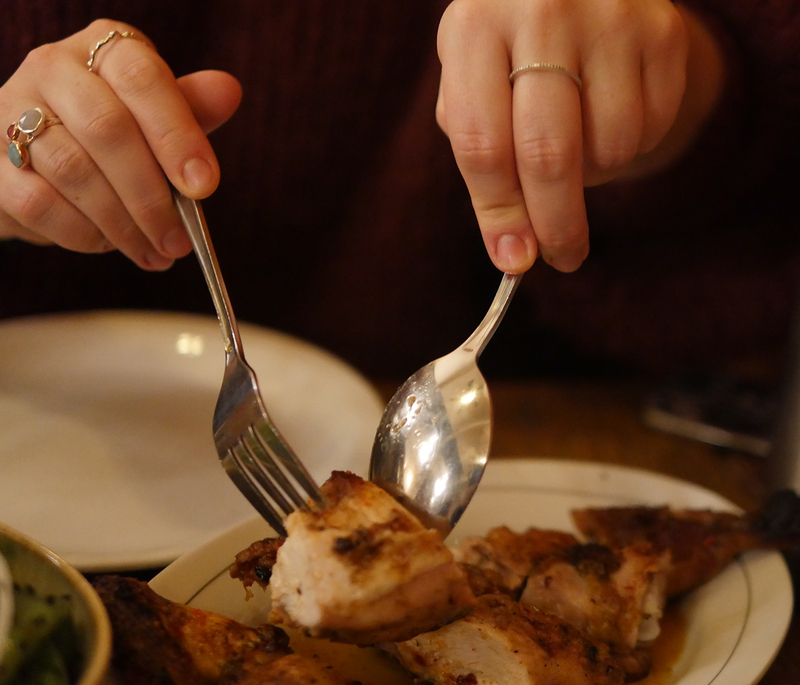 Of course, the Chicken at Casa do Frango, the Chicken House, was the main event and we’d ordered two halves – one with a Piri Piri marinade, once with lemon and garlic. Each half came neatly sliced into chunks. Nothing dry or overcooked, a good meaty flavour complemented by the marinades – and just a hint of woody char. Along with the chicken we ordered Batatas fries, which were not exceptional, a delicious plateful of African rice with crispy chicken skin, chorizo and plantain and a lettuce salad dressed with kalonji seeds and grain mustard. Next time I’d skip the fries and perhaps order a chickpea salad with black olives, red pepper, soft boiled egg and aioli in the hope of finding another delicious, unusual and creative dish like the African rice. 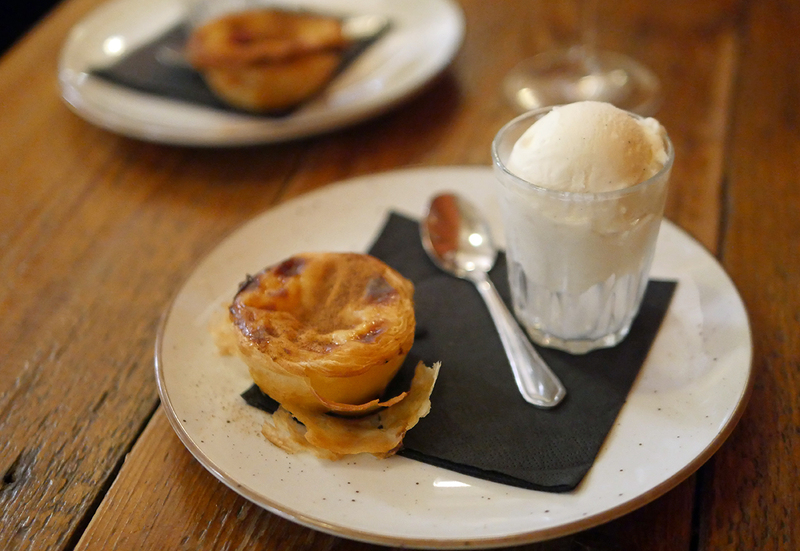 Dessert, of course, had to be the restaurant’s own pastel de nata – traditional Portuguese egg custard tarts. Mine was a cinnamon version while my companion opted for raspberry. 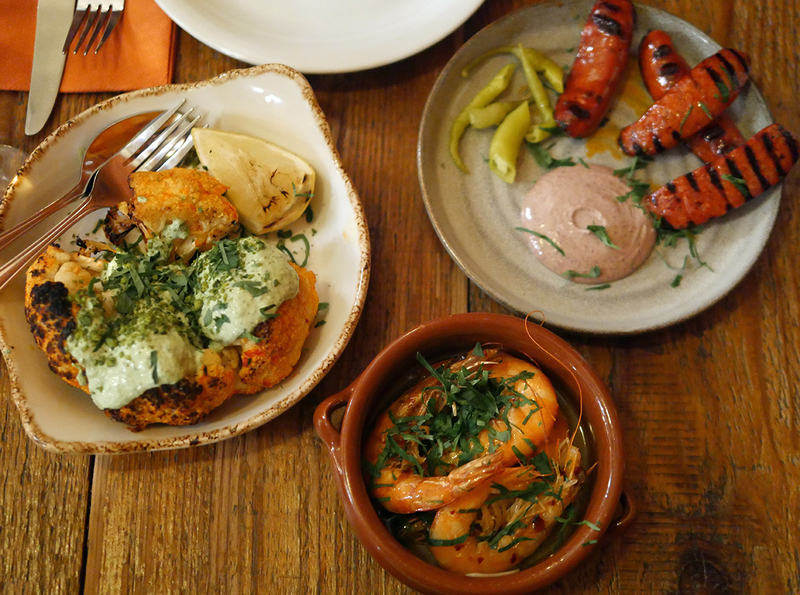 Casa do Frango is the kind of place I’ll go back to if I’m in Borough – it’s just far enough away from the market to avoid the inflated prices and hoards of tourists. And, it’s the kind of place I’ll recommend to anyone looking for somewhere to go as a group and enjoy some really well-cooked food and wine at altogether reasonable prices. A half chicken is £9.00 and side dishes are from £3 to £6. Small plates range from £4 to £9 and wine starts at £23 a bottle. Not somewhere that will break the bank, a place to enjoy the ambience, kick back, relax and spend time with friends. 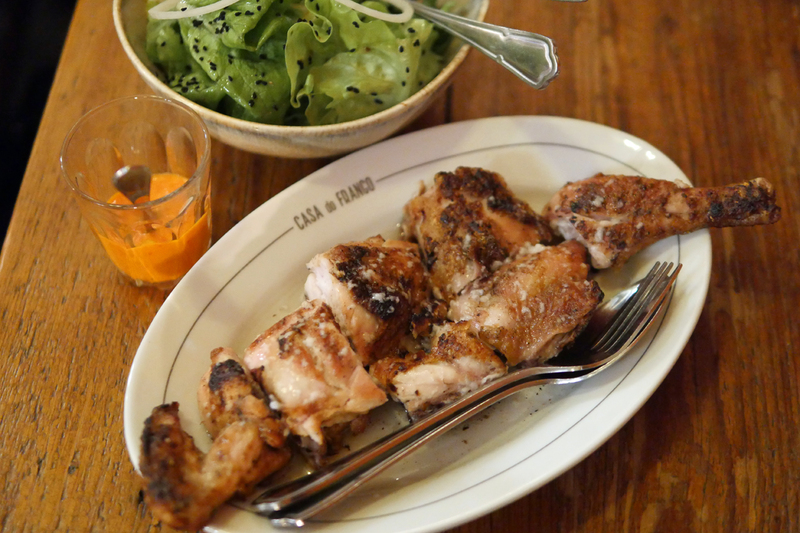 Disclosure – we dined as guests of Casa do Frango – all content is editorially given.